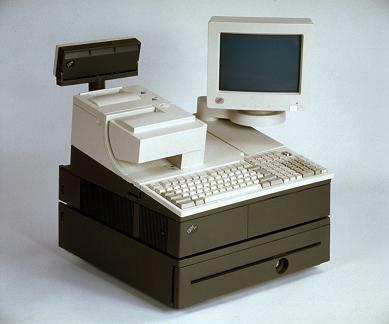 The IBM 4694 model 307 can be used as a controller/terminal, a terminal on a LAN or as a standalone terminal. The 307 is a 64 bit architecture system unit with an 866 MHz VIA C3 processor, 128K embedded Cache, cache, 64 Megabytes of memory, SVGA and DVI-D video with 4 Megabyte of video memory, a 1.44Megabyte floppy drive, two RS-232 ports, a PC keyboard & mouse port, four RS-485 Point of Sale I/O ports, two cash drawer ports, three PC USB ports, one +12V powered USB port, one full length PCI and one full length ISA/PCI feature card slot, a front access dump switch (supported by Windows NT 4.0 ServicePack4 and 4690 OS), 10/100 Ethernet, Desktop Management Interface (DMI) support and a network management enabled BIOS standard on every system unit. The new BIOS supports DHCP and PXE protocols as well as the previously supported IBM RPL, Novell Netware RPL and TCP/IP bootp protocols. The 307 has the capability to expand to 512 Megabytes of memory with two 168 pin, SDRAM PC-133 compatible DIMM memory sockets that can contain any combination of 64, 128 and 256 MB DIMMS. The model 307 is a narrow footprint model and has the option for one 20 GB Performance Hard Disk Drive, a Token Ring adapter and the Advanced Power Management (APM) compliant Power Management feature. Wake on LAN is supported with the Power Management feature on the 307. This model is suited to the customer with space constraints or who wants to distribute the POS I/O and is running Windows or 4690 OS with an interest in using the Java Virtual Machine enhancements of 4690 OS V2.